If you haven't noticed me, I've been on UKMix awhile but only recently really got into it! I've been following several personal charts for a few months now, and really love seeing everyone's varying tastes in music, and thought it was about time I started my own chart. I'm going to *try* to keep it nice and organised, but I can't promise anything My weekly personal chart will from now on be updated every Monday and consist of 3 charts: Top 20 Singles, Top 5 Albums and Artist of the Week. There's not really any science or rules behind who and what can chart each week, but EPs are eligible for the albums chart only and for an album to qualify for my charts I need to have listened to at least 5 tracks (not necessarily the entire album) and it needs to have already been released (as an example, Foxes has premiered 5 tracks from her forthcoming album All I Need, but as it's not released yet it can't chart early). Yay at all the Troye! Church Bells is immense, my favourite from Storyteller. Glad you like it. Great to see a couple of songs from Wrapped In Red Underneath The Tree is one of my favourite Christmas songs, she released a real classic. Great to Storyteller & Wrapped In Red on your album chart. Hope to see WIR rise as we get closer to Christmas. Yeay glad you started a personal chart! Welcomeee!! Haven't hear Troye's album but I will check it soon. But I loveeee A Head Full Of Dreams and Storyteller!! CB is my fave from storyteller too! Yessssss Joseph!!! Slay a bit. You have great taste! I'll check out those Tori songs because I like her voice but find her so vanilla. Nothing stands out on the album as such. I also like "Hymn For The Weekend", "Used To Love You" and "Happy"
Just checked out your #1 and it's beautiful! I just downloaded it. Also great to see "Church Bells" and "When We Were Young". Both songs are brilliant. I'm glad you like it! I find Tori kinda boring but she's a brilliant songwriter and has crazy vocals! Nice for USED TO LOVE YOU, When We Were Young and Hands To Myself. Love those 3. But seriously that GOLD song is hideous. Nice to see you here in the Personal Charts section! 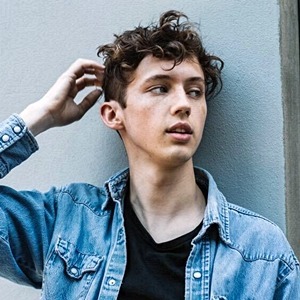 - To be honest, I haven't really listened to any tracks by Troye Sivan yet (only 2 snippets on iTunes but it wasn't bad after all). However, I'm glad to see that we share the love for Coldplay. A great album and it deserves to be #2 on your chart! "Underneath The Tree" has become a Christmas classic in my household. Also, "Fund" & "Hands To Myself" and of course, "Same Old Love" are amazing songs. Great debut for a personal chart! thanks so much! check out the rest of Troye's album because it's great! really like Coldplay and particularly their new album - it's great! Really, really, really glad you decided to create your own personal chart!! I really like your Top5 artists. Not the biggest fan of Tory but only because i haven't heard that much stuff from her. The other four artists are all great! Quite surprised to see Sia's "We Are Born" there too. I think this album is actually better than "1000 Forms Of Fear" and i looove "Bright Night" and "I'm In Here"
Last but not least, the Top20 Songs are obviously great too! "Church Bells" MUST be a single in the future. I hope they release it after "Heartbeat"... can't wait to see a video for it! thanks so much Tansike!! I really appreciate it! Haven't hear the Troye Sivan album cause I lost my internet connection yesterday But glad to see Carrie, Coldplay, Marina, and Kacey still there! Oh and believe or not, I'm listening to Wrapped In Red now Not sure If I will finish my listen to this album tho..
Underneath The Tree is really catchy, really reminds me of Mariah's track.